Your dog is dependent on you to feed them correctly, but there are many choices out there and no dog is the same inside or out. A dog can be viewed as a beloved family companion, can be a working animal, or could be an outdoor pet. Despite the different levels, each dog has their own needs regarding the diet, and how they are fed can either increase their health status or contribute to its decline. This becomes an important factor as it can then influence health problems that may become costly to manage through ongoing veterinary care. When the right diet approach is used in your dog, feeding them based on their personal needs, then not only can they be healthier and more active, but the overall expense associated with dog ownership can be greatly reduced. So, what do I feed my dog? Food is essential for all living beings, as it serves as a source of fuel not only for energy production, but healing and immune function. What goes into your dog’s body can either work for them or work against them. Owning a dog can be expensive, and being a veterinarian I have seen many chronic health conditions that have costed the owners significantly or even costed the dog their life. Through a modification of the diet, many of these conditions could have been improved or better managed, if not completely eliminated through prevention. The choice is up to us, as owners, and that choice is dependent on our view of what is and what is not important. What you choose to feed your dog can make all of the difference, but seeing this and acting upon it is dependent on your personal goals and priorities. There are many different circumstances that revolve around the dog and their diet. In one circumstance, an individual may have 5 or more working dogs used for hunting and kept outdoors. In another situation, a person may have a family pet that is kept in an covered lot. Then, there may be a person that views that dog as a true companion, part of the family, and they are allowed indoors with access to the luxuries of a human being. At the other end of the spectrum, we may have a rescue group or animal shelter that is barely keeping their heads above water supporting many animals that have been abandoned or lost. Each of these situations yields different approaches to diet, with the main emphasis on economics and time. There is no ‘one’ right way to feed your dog, but more so it is dependent on your personal situation and goals. For many, a simple approach works just fine as there are other influences towards health. In other cases, some dogs suffer long-term or chronic health ailments, which are costly and reduce quality of life. The long and the short of it is that if your approach is working, from your perspective, then there is no reason to change unless you desire that change. However, if your dog suffers health related problems, then a change in diet or at least a reevaluation is likely needed. Commercial or processed dog foods were created for the same reason as processed foods were in people, mainly being for convenience, cost, and sustainability. These diets come in bags from a grocery or feed store, are in kibble form or moist cans, and often have a long shelf life due to additives and preservatives. The goal was to create a food source for dogs that was easy to obtain, easy to feed, lasted a long period of time with low spoilage, was cost effective, and provided an accepted level of nutrition. There are many different brands of commercial feeds from the grocery store brand to one with a celebrity chef on the bag. They can vary regarding their ingredient content, but if it is in a bag and has a long shelf life, then it is a processed food. Again, this can work for some dogs, while others desire and crave more. In addition to the traditional processed dog food, you then have more specialty or prescription processed diets that are often obtained from your veterinarian. These dog foods are used to target specific health ailments including heart disease, digestive concerns, allergies, and kidney conditions. They are specially formulated to include higher levels of some nutrients, with maybe lower levels of others, depending on the health condition targeted. They can be helpful, but again, they are processed foods. A processed food is one that has been transformed from its original form into another food product. There are many levels of processing that can take place and with each level of processing, there is often nutrient loss. Wheat grains can be ground into flour, which is a basic level of processing. Then, one can take that flour, add in other preservatives, dyes, and artificial ingredients, and you then have another level of processing. In some foods, the ingredients used are by-products, some are artificial or man-made, and others are purely chemical in nature. Some of these ingredients are not even available in nature or even recognized by the body as being food. In many cases of commercial dog foods, the ingredient list can be disturbing. 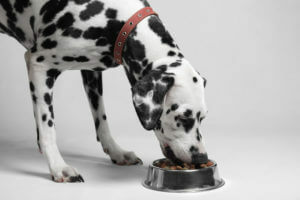 The dog food products may boast a certain level of nutrients or nutrition, but often these nutrients are added at the end of the processing technique to re-fortify what was lost during the creation. The nutrients, when added back in, are not natural, but synthetic in origin, created in a laboratory. There is convenience and often cost saving associated with the use of these commercial, processed dog food diets, but for some pets, they desire and crave more for overall health and healing. What is the Difference Between Whole-Foods and Processed Foods for Dogs? The definition of a processed, commercial dog food was outlined above. This type of diet was created for convenience and cost savings for the dog owner. For many dogs, this type of diet works, but even if we perceive that it works, how do we define that? How do we truly know it is ‘working’ for our dog? Are they healthy and vibrant? Or do they continue to have health problems, even on a basic level? Whole-foods are a food or substance that has been processed as little as possible, with no added chemicals or preservatives, and retaining most of its original nutrient provisions. The concept of whole foods creates much confusion in many dog owners, when really, the concept is quite simple. A whole food would be an apple, as an example, while a processed version of that apple would be apple sauce. A whole food would be a whole chicken breast, while a processed version would be a lower cut of meat, ground up and combined with other synthetics and preservatives to create a dry kibble. A processed dog food may contain some natural nutrient value, but it is often very low and lost during the processing stages. Due to this loss of nutrient value, many vitamins and mineral are added back in during the final stage of production, in a synthetic form. A whole-food is different, as most of its nutrient density is still intact. Whole foods have the benefit of not just providing macro- and micro-nutrients, but also provide high levels of natural co-factors and phytochemicals that also influence health on another level. The co-factors may assist with proper digestion and absorption of those nutrients, while others may synergistically work with other nutrients giving an additive effect. Phytochemicals, such as chlorophyll, polyphenols, and anthocyanins, are very important health boosters found in many whole-food sources that can demonstrate anti-oxidant effects, help to curb inflammation, support immune and digestive health, and even influence normal gene function. Many times, the phytochemicals present in a whole food source are evident in the coloration of that food, such as being green, vibrant red, yellow, or purple. Those food colors are the result of the phytochemicals present. The difference between whole-foods and processed foods is night and day. The many health benefits of whole-foods for your dog are simply not obtained via processed foods. A processed food may have vitamins and minerals, but those are often synthetic and not natural. In addition, there are rarely the additional co-factors or phytochemicals present in a processed food, which can often either make or break health for your dog. This question can only be answered by first asking what your priorities and goals are for your dog. Second, then you have to look at your dog, determine their needs based on their body type, breed, and current health conditions. This is not always easy to do and is one main reason why many dog owners stick with commercial feeds. Plain and simply put, they are easier to buy and feed. Again, there is no right or wrong approach. It is all dependent on your goals as a dog owner. If your goal is to keep it simple and convenient, while striving for the best health support possible for your dog, then commercial dog foods may be a good choice. There are many different types and brands on the market, so if I was to choose one, it would be based on the list of ingredients. The first thing is to be able to read the ingredient list. Are you able to pronounce the words? Do you recognize what each ingredient is? Are the meat and protein sources from by-products and scraps, or are they from whole sources? Do you see a laundry list of added ingredients, including isolated vitamins and minerals? These are all going to be present in most cases of commercial foods, especially if they have a long shelf life. The ultimate question is which dog food has the ‘cleanest’ label? Which one has the fewest additives? If you can find it, then that is the one to feed, if you are going this route with commercial dog foods. Keep in mind, though, that many of these foods can be hard to digest for some dogs, and the ingredients present can contribute to many health conditions. Not only are the nutrients often in artificial form, but the many chemicals present can create health problems in your dog. So, again, the goal is to keep it as clean as possible. When it comes to prescription, commercial feeds, I have never been a fan as a veterinarian. First, you have the concerns of a processed food, which all of these are, but even more so, the diets are often targeting one health condition. This can create problems for the rest of the body and overall health. A prescription diet may be created for management of allergies, using non-reactive an un-natural protein sources which may help to reduce the allergy response, but the diet may be deficient in other nutrients that benefit cardiovascular health. Then we may have a diet that is used to target weight loss, and provide a marked reduced caloric content and high fiber, but the rest of the body including the immune health, may suffer as a result. Rarely, in my opinion, do patients benefit in the long-term from these prescription diets. More so, what I have seen as a veterinarian, is that through their use you may be able to gain weight loss or improve heart function, but often we then start to develop other health concerns such as dry, itchy skin or altered bowel function. It was rare in our veterinary practice to truly improve a patient’s quality of life through a prescription, processed food or diet. To me, as a veterinarian and dog owner, I have always recommended home cooking, which takes advantage of whole-foods and their health benefits to the dog. When we would take advantage of these types of diets in our patients, no matter what the disease process, the whole patient benefited and quality of life improved in almost all. However, there was one limiting factor. The dog’s owner! I am a proponent of encouraging health, not discouraging it. I realize that in veterinary medicine, our patients are not human, and no matter how close of a companion they are perceived as being, time and finances come into play. With that being said, convenience is then also a factor, leaning on the side of increased convenience. Thus, there is a need for the processed, commercial dog food for many owners. I do see the convenience and potentially the money saving factor, but again, you need to ask what your goal is and whether if this is helping you to get there or inhibiting you. In my canine patients and in my own personal dogs, we feed and recommend whole-food diets. In most of those cases, these were home cooked diets. In today’s world, there are some more whole-food diets that are available, pre-formulated, and available in the cooler section of the grocery store. Even though those diets are available, I do encourage you to read the label and also understand that THAT particular diet or food may not be right for your particular canine pet. The protein source that you choose for your dog will vary dependent on their constitution and needs. Red meats are generally more heating to the body, and thus they may not be ideal in a dog with red, itchy skin. Chicken tends to be more neutral in energy and easy to digest. Fish are generally perceived as being more cooling to the body. No matter the choice, consider the source of that protein, ideally using at least very low fat, if not a grass-fed source, or wild-caught. The vegetables should be mixed, ideally taking advantage of the colors of the rainbow. In most of our dogs, we would used mixed vegetables and legumes, including beans, peas, carrots, and corn to an extent. You can certainly add in others, if desired, and evaluate how your pet responds. The carbohydrates are needed for energy production in the body and low-glycemic carbohydrates are our ideal source. These can be whole grains, such as rice, but can also include yams and potatoes. Preparing this meal is often what deters most owners, as does a perceived cost. The reality is that cost is generally not a real factor, only perceived. You can put together a week’s meal, in a slow cooker, on a weekend afternoon. This meal can then be subdivided down into zip-lock bags and stored in the refrigerator or even frozen. If you put together the cost involved, you will often find that the expense is really minimal, and the nutrient benefits to overall health are superior to any bagged food. The next question is whether to serve this meal cold, warm, or hot? First, the food is prepared by heating, in order to fully cook the foods. I do not feed ‘raw’ diets to our personal dogs or patients. I prefer, personally, to feed the meal warmed or at least at room temperature. This natural warming will encourage digestion, while a raw or cold diet tends to discourage it. Thus, some pets do experience gastrointestinal distress on cold or raw diets. Then again, a hot or irritated dog may benefit from the cold or cooling diet. Now, many will raise the question as to nutrient deficiencies. Is your dog getting enough? That is a good question and many will claim it is insufficient, but experience tells me that most dogs do just fine if not better than they were before. The volume of this food to be fed will vary from dog to dog, and this is something that you as the owner have to figure out while watching their body condition and weight. I generally start with around 2 cups per 50 lbs twice daily and monitor. I have not had to add any further nutrients to their meal, with the exception of a calcium supplement as mentioned above. In other cases, I have the patients or my own dog on a general health herbal formula, which inevitably also supplies nutrients in their natural form. I have never encountered a deficiency type of status, given this approach. Most patients, if not all, do quite well with this home-cooked approach. For some, we need to modify that diet to take advantage of more warming or cooling foods, but for most, that simple approach works. They do much better and their health improves. Is this a direct result of the whole-food diet, OR is this due to elimination of a potential contributor to their ill-health, being the processed food? I do not know the answer, but overall our goal was to improve health in that dog, and this approach helped us to get closer to our goal. Never dismiss the food your dog eats. The diet you supply will either work for you or against you, as the owner. If you are encountering ongoing health concerns in your dog, from allergies to cancer, it is time to re-evaluate their diet. Making a change can make all of the difference!